arranged interiors you will find everything that is necessary to feel really better and safe. and opposite the MainTown Hall is an ideal place, from which you can begin your town experience. The tenement was built c.a. 1560, ordered by Gdańsk patrician Hans Conert. It was the first and modern in its form tenement in Gdańsk. It is said that the tenement was designed earlier than the Ferber's Tenement at Długa 28. The pioneer work but in mature and outstanding form as well as the art setting. The designer, architect-sculptor is unknown. Certainly his name is present in the town chronicles but today we are not able to associate him with this daring and effective undertaking. Time and circumstances of the Conert family house ruling end are not known yet. We know that in 1608 the parcel was owned by a certain Hans Hoefke. But in 1616 the house at Długa 45 was owned by Engelbrecht Konig - the merchant coming from Schoppingen in Westphalia, who settled permanently in Gdańsk and was granted the citizenship of Gdańsk. And with this owner or more precise with his surname, the misunderstanding is connected, which is also present in guide literature. The Konig's (Konig means King in German) contemporaries used to name the houses not by numbers but often by surname of the owners living in the house. They were certainly saying "in the King's house", "by the King's house" - because it was a name of the owner. Later, when the memories of the former owner dimmed, only the name "King's house" remained. And as Gdańsk was at that time a part of the Republic of Poland - it is obvious that it was certainly the King of Poland. As there were many Kings visiting Gdańsk, only one step was needed to call it "The Polish Kings House". After all no King lived or stayed here during visit in Gdańsk but the erroneous information make us aware of the fact that the tenement is worth to welcome such a personage to its abode. 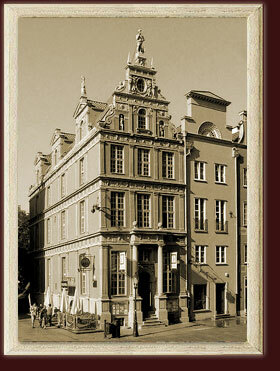 Then for over two centuries, the house belonged to the well known in Gdańsk Schumann family. After the middle of 17th century, the tenement ownership was transferred to the oldest son of the family. Still in 1858 the tenement belonged to the unknown name Miss Schumann. Due to relatively long ownership by this family, the tenement was often called the Schumann's House. It is one of the most known families in Gdańsk. Three mayors, six town councillors and four jurors came from this family as well as a famous embroiderer, whose works are presented in NationalMuseum. The chronicles indicate that in 1878 the tenement was owned by the Merchant Bum or Baum in other transcription. From 1896 the tenement was owned by heirs of Daniel Alert. In 1912 the tenement was strongly reconstructed and intended as a coffee house. The signboards are clearly visible on photos from that period. From 1917 the tenement belonged to a Berlin Company "Disconto Gesellschaft Danzig". After the Second World War and reconstruction, the tenement was a seat of PTK and then PTTK (Polish Tourist Association). Characteristic combination of red plaster plane and light features of sculpture details constitute the setting of one of the most beautiful European squares - Gdański Długi Targ. The noble and harmonious interiors of the oldest Renaissance building on Trakt Królewski (The Royal Route) are an excellent setting for subtle leisure and its closest neighbourhood guarantees unforgettable impressions and great fun for the entire time of stay.